The D&H Classic Colours Leather Lead is stylish and comfortable to hold with a traditional feel. This D&H luxury leather dog lead gives all the elements of quality with a traditional look. The Classic Colours Lead from D&H is made from luxury hide. The handle is lined with soft leather in a stylish cream colour and the lead is finished with solid brass fittings. 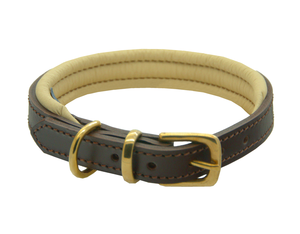 Available in two classic combinations: dark chocolate brown with cream lining or bridle tan with cream lining. Care Guide: Leather is a natural product. To ensure its durability, allow to air-dry completely before re-use if your lead gets wet. Do not allow the leather to come into contact with the chemicals from commercially available flea spot-on treatments. This will damage the leather and may cause the dye to run.